The base model gains new safety equipment and the rear-wheel-drive Stinger GT gets a limited-slip differential as standard. 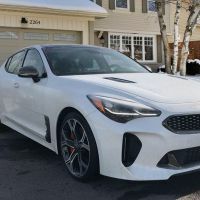 Earlier this year, Kia had announced a limited-run of the 2019 Stinger Atlantica, which featured exclusive options only found in the European and Korean spec of the Stinger. In a statement to Car and Driver, Kia spokesman Neil Dunlop said that model has been "put on hold indefinitely," adding that Kia is "considering other special editions" of the Stinger. I think this means that the Atlantica was cancelled due to the additional changes to the 2019 models.